Adds many more perks to the werewolf tree, including new howls, ignore armor, resting bonuses for werewolves, moon-based health bonuses, buffs in human form, and more! Gruftlord - Lots of helpful feedback and suggestions during development. Icrusher - Testing Special Edition compatibility and uploading for console users. NEWS: 1.7 update has arrived. Removes running speed/silver changes from Beast Nature and fix/replace Hircine's Blessing. Adds new perks to fill some needs and round out the balance changes. The Werewolf Night Eye power is now learned from a the book "Totems of Hircine", found in Jorrvasker somewhere. Please re-read perk descriptions for more details. An immersive way to change perks on the go, without menus. The new amulets can be purchased from the frostmoon pack, like the rings of Hircine. Much like amulets of the Eight, these amulets give the same effects as the static shrines of Hircine, changing your equipped howl when you put them on. Just a fun plugin I made for myself. 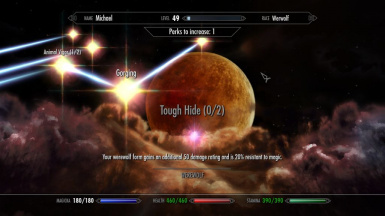 After completing the werewolf perk tree for dawnguard, I was surprisingly underwhelmed. A little extra health and more base damage were nice, but at lvl 50, it just wasn't enough, especially above adept difficulty. So, I added a few more perks to the tree, changed the game's built-in cap on werewolf perks, and tried it out. My goal with this mod is not a werewolf overhaul or a new werewolf system. I'm simply correcting a lot of the unnecessary weaknesses that vanilla werewolves have and rebalancing werewolf powers to be as useful to your character as vampirism, albeit with less sunburn. 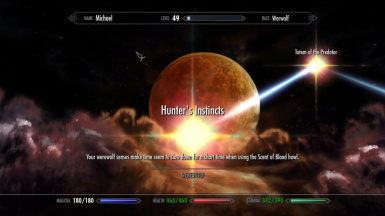 A lesser power known as "Hunter's Sight" was in the game and meant to be used by werewolves. Since it was not implemented, I have added it myself. It can be learned by using the book "Totems of Hircine" found only in Jorrvaskr, somewhere. Just look for it. These perks can be selected the same way the other perks can, and require a rank in the previous perk before they're available. 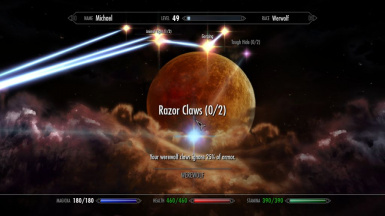 -Razor Claws: Ignore 25% of your enemies armor per rank, in werewolf form. -Tough Hide: Additonal armor rating and magic resistance in werewolf form. In addition to leveled werewolf armor rating. After 1.7, with this perk, and at lvl 40-50+, your werewolf form will be at or above the armor cap. -Rank 1: 100 armor and 25% magic resist. -Rank 2: 200 armor and 50% magic resist. -Beast Nature: Adds buffs to stamina rate (50%), unarmed damage (40), and reduces the stamina cost of ALL power attacks by 10%. -Full Moon Rising: An ability that was already in the game files but not used. You get 150 extra health in werewolf form and 75 in human form when the moons are in the sky (8pm to 5am). The following perks add a second Word of Power to the vanilla howls. TO USE THE VANILLA HOWL, TAP THE SHOUT BUTTON. TO USE THE SECOND WORD OF THE HOWL, HOLD THE BUTTON DOWN. Without the corresponding perk, these "long" howls have the same effect as the vanilla howl, but with a cooldown. With the perk, the long howl has a a new, powerful effect that complements the vanilla howl in some way. The cooldowns are there to balance the otherwise overpowered new howls, but still only require a short wait after the howl's effects have worn off. Please don't complain about cooldowns. An eight second break between sessions of face mauling is just fair play to your enemies. Also, it prevents the spell effects from getting stuck or glitching. 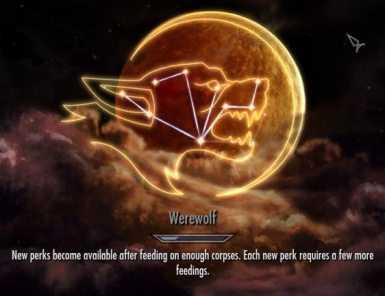 Compatible with Moonlight Tales or most any werewolf mod that doesn't edit the perks or howls. This mod makes no changes to the werewolf race or any script. If you use any mod that changes howls or werewolf perks, the mod you load last will override the other. 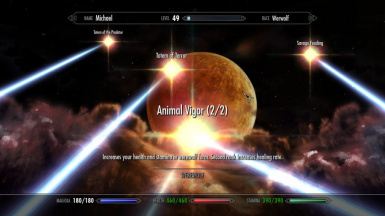 Load this mod last if you want its effects. -Two versions. Changes how Beast Nature works: 1.6 uses speedmult script, 1.6b uses magic effect to modify movement speed. Only run one .esp at a time. -Removed weapon speed mult from beast nature. -Silver weapons now affect Beast Nature, and the description accurately says "undead and werewolves" take damage. -Fixed possible bug with Howl of Terror. -Increased cooldowns on new howls. -Added Hunter's Sight (nighteye power) activate the Hunt Totem and you'll get the spell. -Added Feral Rage, Modified Hunter's Instincts to match it. -Made the perk tree look better. A: As soon as I'm sure it works, you'll have it. I do have to sleep. A: Yeah probably. Though I'm currently at the point where I'd rather make the current changes better rather than add new material. A: Tell me what it is. This plugin is very simple at its core, and uses almost entirely existing assets from the game to avoid bugs/crashes/weirdness. If something is wrong, its likely my error and I will gladly fix it and upload a new version, just for you. Possible bug with getting more than 11 perk points, but it works so far. Feedback is appreciated, feel free to request perks.